As you may remember, I started going into Home Automation last year with a C++ project, Asgard. Unfortunately, I haven't add the time to improve this project further and make it really useful and I have so many C++ projects already, so I decided to switch to using an existing project. It's impressive the number of home automation projects that exist today. It's really a hot topic, more than I though. After a few hours of research, I've finally settled on Domoticz. It seemed that it could handle all my home automation devices that I already had. Domoticz is an open source home automation system. It's written mainly in C++, which is an advantage for me since I'll be able to work inside it if necessary. It has a quite modern HTML5 interface. It has a lot of support for hardware and a lot of bridges for other controllers as well. One of the reason I chose it is also the floor-planner feature that looks really cool. First of all, I cleaned the hardware of my Raspberry Pi. I got rid of my breadboard and the components on it. Then, I put the Raspberry Pi on a nicer box that I had laying around. One problem with Domoticz is that it does not support directly RF433 devices, but need a controller in the middle. At first, I believed I could simply connect them through GPIO and lets Domoticz do the rest, but it's not possible. I ordered the different pieces for a RFLink controller at nodo-shops. It is running on a Arduino Mega and is connected to the Pi. The very big advantage is that they handle a lot of protocols directly, so you only have to read the serial port to get information on RF-433 events. 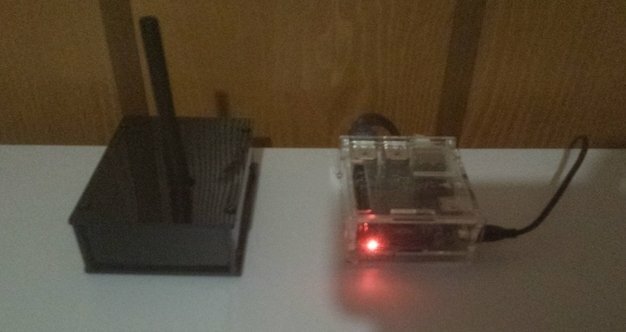 The black box is the Arduino Mega with RFLink software while the Transparent is simply the Raspberry on which Domoticz is installed. After a few questions, your installation should be complete. You can browse your Domoticz installation at the IP of your Pi and at the given port. There are several concepts in Domoticz that are important. At first, it seemed a bit weird to me, but in the end it works really well and you get used to it pretty fast. I've got some sensors from the motherboard, the Kodi interaction, the driver to ping the different computers, the Forecast weather with Dark Sky and Weather Underground, the RFLink communication, the wake-on-lan and some dummies virtual switches. As for my hardware I already had, I haven't add too many issues with them. The Oregon Temperature Sensors worked out of the box without any issues as well my old RF433 Ninja Block temperature sensor. The smart power outlets have been pretty easy to use as well. The most problem I've add was with the remote buttons. It seems to many that it should be the easiest, but RFLink has a lot of problem with them, they are detected several times and are highly unreliable. Interestingly you can also change the icon of most device to a large variety of existing devices so that they would look more realistic. Another feature I find pretty cool is the floor plan. You can create plans for each floor of your house and then create rooms inside and finally attach devices to each room and place inside the plan. Unfortunately, to draw the plan, you'll have to use an external tool. I've used floorplanner for this, but you may use any plan you have as long as you have an image. Normally, my Somfy blinds are supposed to work with the RFLink controller. I have managed to control my blinds but only when the RFLink was within 50 centimeters of the Blinds, which is clearly not acceptable. I don't know from where the problem comes. It may come from my Blinds controller inside the wall or may come from bad antenna of the RFLink or from a bug in RFLink, so from now I cannot control my blinds. I have several D-Link cameras at home. You can also add cameras to Domoticz, but don't expect a lot of support on this side. It's pretty poor indeed. The only useful you can do in Domoticz with Cameras is to take a screenshot from them. You cannot control the Camera or even have a decent video stream and cannot do motion detection directly. I hope that the Camera support will improve in the future. 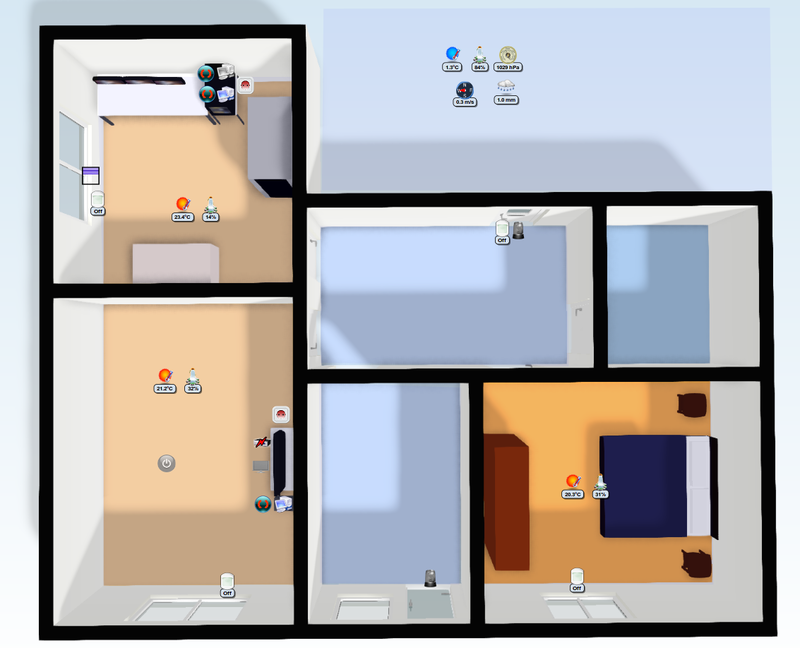 One thing that would be good is to add a view of the cameras in the floor plan, but it is not possible currently. What I did is to use Zoneminder to manage the cameras and send alert to Domoticz when motion is detect with the REST API of Domoticz. Unfortunately that means two systems to manage the Cameras. Zoneminder is a very good piece of software, but one of the ugliest I've ever seen (even I can do a better web interface...) and quite obscure to configure. But the numbers of cameras it can handle and the capabilities to control the camera is very very powerful. No home automation system would be complete without an events and rules system. In Domoticz, you have several ways to create rules. The first solution is to create group. A group is simply a set of switches that are all activated together. This is pretty limited, but can be useful. The second solution is a scene. A scene is activated by a device and can set several switches to on or off after the activation. The problem with this is that you have to listen for an action as activation, you cannot use an existing device or a rule with a value. For me, these two possibilities are way too limited and I don't really a reason to use them. In the end, I used Lua script directly. These scripts have the information about the last values of each device and the last updated time as well. It's much easier with that to create powerful rules especially when you want a notion of time. There are plenty of examples on the Domoticz forum about very powerful rules that you can create. Unfortunately, there are some limitations. For instance, you cannot send several actions to the same device in the same script Moreover, you also have to decode the values of the sensors yourself. For instance, for a temperature and humidity sensor, you'll have to parse the values and extract the one you need by hand. So far, I haven't created many rules, only four. The first rule is that with the push of one remote button I can power on my smart socket and turn on one of my computers in my office. Then, if both the computers on this smart sockets have been off for more than 60 seconds, the power is shut off on the smart socket. And I have done almost the same for my media center and TV in my living room. In the future, I'll probably only use the Lua scripting capability. In my opinion, it's better to have all the scripts in the same language for maintainability reasons. Once my futures devices arrive, I'll have a few more rules to code. To wrap up, I'd say that I'm pretty satisfied with my new home automation system with Domoticz. It's not a perfect tool, but it has a lot of features and is working quite well in general. I would recommend you to try it if you want a good home automation system, fully featured and relatively easy to use. I've several more things planned for this system. I plan to test a real motion sensor rather than rely only on the cameras which are focused on the doors and windows. I also plan to add an outdoor temperature sensor. And more interestingly, I'm going to try to integrate smart bulbs from Milight to be able to control my lights from the system. These are the shot term projects that I want to do, but I have many more ideas! I'm also sure that there are some features from Domoticz that I have overlooked or not discovered. I'll probably write more posts on Home Automation on the coming months. For more information on Domoticz, you can consult the official Domoticz website.